Little Rays of Sunshine! : An Official Mormon Mother!!!! Today marks the day that I officially became a true Mormon Mother!!! Yes everyone....today I made my first casserole, if you will. I got the recipe from a wonderful fellow blogger and it turned out great! Yes chicken spaghetti with all it's wonderfulness was quite the hit tonight when Chris got home and we ate dinner. Even Chris's mother came over for a taste. Although it all turned out great in the end, the final culinary masterpiece didn't happen without it's many steps in between. The first of which I almost burned the kitchen down. Yes as I turned my back to see what thrilling topic Oprah was going to be talking about today, I suddenly realized the funny smell I was smelling wasn't my spit up stained shirt, or the wonderful load of laundry from Jayda's prune explosion, or the whole can of Raid bug spray that I had sprayed earlier when I saw 3 ants....(what? 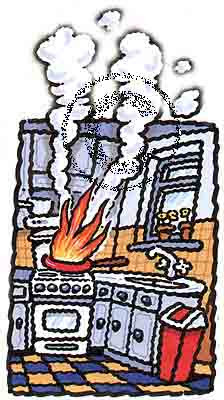 You gotta kill those puppies from the source or they multiply like bunnies) I turned to find flames coming out from underneath my pot of water that was supposed to be boiling!! Scream, panic, scream, scream!!!! Blow and then douse with water! Ahhhhh the flame is out :) Little did I know my first time ever boiling chicken could be such an exciting event. I thought to myself, man step one was a doozy I better put on my girls camp apron just to make sure my wifely domesticated skills would be complete with the full effect the apron would have.......b/c you know the casserole will taste better if it was made while wearing an apron! 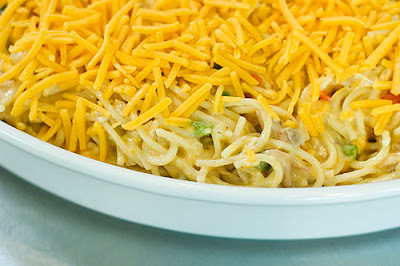 :) For all of you pyro, chicken spaghetti lovers out there, try this recipe it's a winner! Haha, you soo crack me up! I loved reading your post. So where did you get the recipe so I can try it. Always looking for something new. Also, I love the swing pictures! Congrats, you're official! Now you can check out a website my sister sent me....mormonchic.com. A few more casseroles and you'll be wanting to buy one of their logo shirts! :) Jayda is getting so big and so cute! awwwww denee' your such a susie home maker!!! lol have fun dont burn the kitchen hehe lol!!! !